Eliza Doolittle and Henry Higgins make an incomparable pair of sleuths in the start of a delightful new series. Following her successful appearance at an Embassy Ball—where Eliza Doolittle won Professor Henry Higgins’ bet that he could pass off a Cockney flower girl as a duchess—Eliza becomes an assistant to his chief rival Emil Nepommuck. After Nepommuck publicly takes credit for transforming Eliza into a lady, an enraged Higgins submits proof to a London newspaper that Nepommuck is a fraud. When Nepommuck is found with a dagger in his back, Henry Higgins becomes Scotland Yard’s prime suspect. However, Eliza learns that most of Nepommuck’s pupils had a reason to murder their blackmailing teacher. 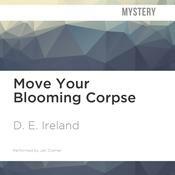 As another suspect turns up dead and evidence goes missing, Eliza and Higgins realize the only way to clear the Professor’s name is to discover which of Nepommuck’s many enemies is the real killer. When all the suspects attend a performance of Hamlet at Drury Lane, Eliza and Higgins don their theatre best and race to upstage a murderer. This reimagining of George Bernard Shaw’s beloved characters is sheer pleasure. 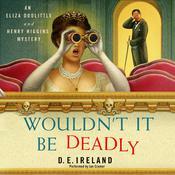 Wouldn’t It Be Deadly transports listeners to Edwardian London, from the aristocratic environs of Mayfair to the dangerous back alleys of the East End. 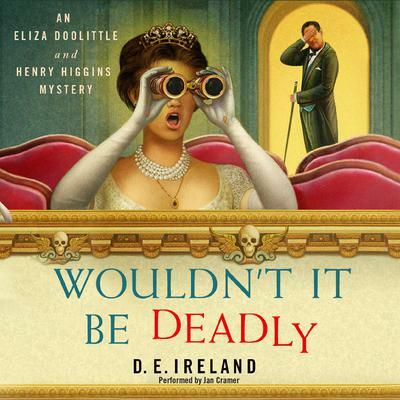 Eliza and Henry steal the show in this charming traditional mystery.